Highlight Features Include: Upgraded Twin 300 HP Caterpillar Diesel Engines, New Canvas & Upholstery (2014-2016), Upgraded Electronics (2012) and new bottom paint (2016)! out well as a family boat with nice appointments and room for all. With her wide beam, open cockpit, she also works really well for evening cruises and long trips. Her well-kept and well-appointed interior with large galley, comfortable booth-style dinette and easily sleeps four. Livewell, insulated fish-boxes, tackle center, dual wash downs are in cockpit. 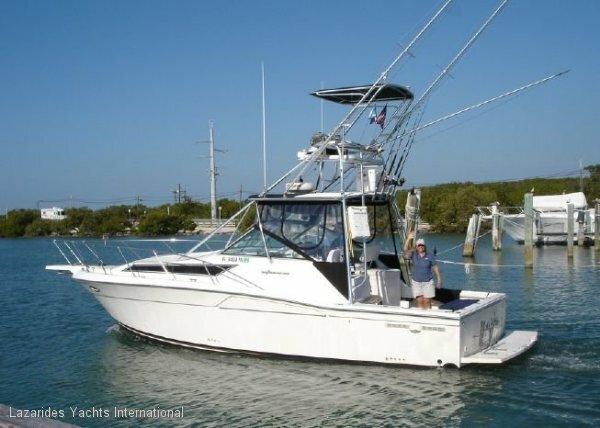 Includes an Onan 5kw generator (2010), AC, excellent electronics, windlass, replaced fuel tanks, and newer enclosure (bimini-2018).